I stubbed my toe on a filing cabinet the other day (our old document management system). But it got me thinking about one of the most basic benefits of document management – getting rid of most (maybe even all) paper documents in an office. That means you can get rid of most of your filing cabinets. Until I hit my toe, I hadn't really thought much of filing cabinets. After all, they're in nearly every office and you see them but don't see them, if you know what I mean. You can't make stuff like that up. I never would have believed someone throwing out their back from pulling a manila folder from a filing cabinet. So to save your fingers – or even your back – and consider document management. Document management provides fast access to your business information, saves on physical storage space (freeing up office space to use for anything other than file cabinet storage, and helps you streamline and automate business processes like accounts payable. Plus, fewer smashed fingers, papercuts, or lower back injuries. The top is not extra storage space for boxes or piles of paper – especially for the tall, 4 drawer filing cabinets. Don't place them in high-traffic areas such as hallways – especially near corners. Distracted employees, hallway corners, and drawers opened head-high aren't a good mix. Only open one drawer at a time, even if the co-worker who has opened the bottom drawer is short. 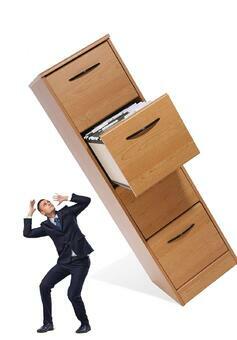 Don't over stuff drawers so that it's hard to remove or replace files – wrist injuries really do happen this way. Not to mention the ever-present hazard of paper cuts! Use the handle to shut the drawer – you don't want to smash your finger! And if worse comes to worse, you can always use them as weapons to attack and board the competition (for non-Monty Python Meaning of Life fans, start the video at 9:16 to see what I mean).